During the time he realized an important factor that plays into the success of anyone in business: relationships. In this episode he shares how his relationships were effected during the launch and what he learned. How Matthew came up with the idea for The Successful Mistake. How he discovered most successful people look at their mistakes as some sort of badge of honor. Even after interviewing 163 successful people about their mistakes, Matthew still had to make his own. What he did that caused his crowdfunding campaign to fail. Why he expected people to spread the word. How he made the decision to give up. Why he said it didn’t deserve to be funded. How easy it was for Matthew to burn relationships. Why he thought he was right to get angry because people weren’t buying his book and helping out. What made him realize he was “That guy” who only reached out when he needed help. What he’s doing to change. 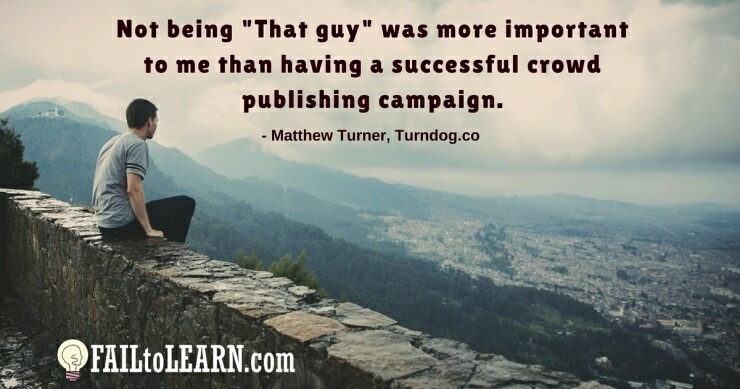 What made his other crowdfunding campaigns successful. Why the, “If something is scary then you need to do it,” advice hurt more than helped. Why he’s still glad he put the book up to be funded and how it benefits him today. How the challenge to get to launch day is terrifies and excites Matthew. How it has helped him build a “Challenge is learning” mindset. Download Matthew’s tips in this episode’s 1-Page Quick Action Sheet.